How is it a 'soft science' ? " Physics is physics. Climate science is "based" on physics (and other hard sciences), and there is nothing within climate science that can be inconsistent with these fundamentals. In order to structure a hard physical model with precision, you need to isolate all significant factors. Global climate is simply too complex to lend itself to this level of determinism. And there is nothing wrong with this fact except for the confusion created by those that cant understand this difference. RSVP, Climate Science involves a lot more science than the use of models. There is lots of 'hard' science going into substantiating the present situation and the projected situations coming from models. But don't despair : there are lots of people out there improving the models all the time and I doubt if they would agree that they are ignoring or unable to consider all significant factors. What factors do you think they are missing or not working on, or do you think they should just give up because it's too difficult ? Also may I suggest that models of weather patterns and ocean currents are probably quite non-linear, so is it possible that small effects could have very large but, difficult to predict, consequences? Zeke also computed linear trends over various time intervals. Over the last three decades GISSTEMP has the lowest trend, NCDC has the highest trend, and all the "independent blog studies" show trends in the middle of the range. And yet another entry in the do-it-yourself surface temperature programs! New ones seem to be popping up about one per week. Once again, the results closely match those from GISS, CRU, NCDC, and the other "amateur" analyses linked above. Not shown in that graph are results from Tamino (who's temporarily offline while moving) and Clear Climate Code (whose results are identical to GISSTEMP). What does this comparison show? (1) The increasing global mean surface temperature trend is not caused by "manipulation" of the data by NASA or UEA-CRU. 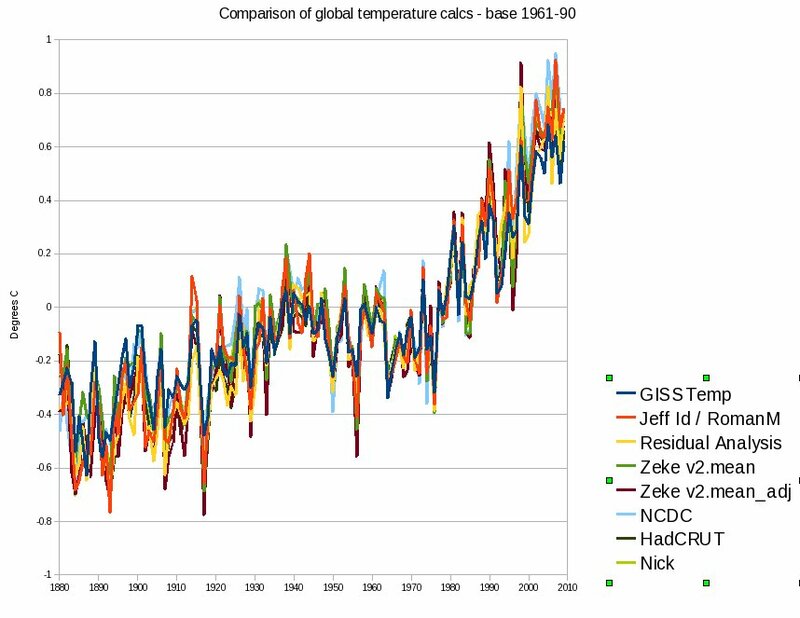 (2) The increasing global mean surface temperature trend is not an artifact of particular algorithms or methods (multiple studies using the same input data but different methods get the same results). (4) "Amateurs" (no insult intended; these people are highly skilled ... but climate science is an avocation rather than vocation for them) can make a very substantial contribution to the field. IMHO this is pretty neat. I'm not entirely certain where to post this, but this thread seems like a reasonable spot. There's a very interesting article in Mother Jones, The Science of Why We Don't Believe Science, by Chris Mooney. This discusses studies on confirmation bias, differing evaluations of legitimate authorities to listen to, etc. Based upon world view and personal orientations: "... people rejected the validity of a scientific source because its conclusion contradicted their deeply held views—and thus the relative risks inherent in each scenario." This holds for both left and right wing politics, individualists and hierarchical thinkers. World views are akin to religions - they form a framework into which people cast their self-image. Anything perceived as an attack on that world view is emotionally interpreted as a personal attack; only later do rationalizations and (possibly) reason enter into the picture once that's begun. One of the take home items from this article is: "If you want someone to accept new evidence, make sure to present it to them in a context that doesn't trigger a defensive, emotional reaction. ... You lead with the values—so as to give the facts a fighting chance." Interesting. The latest issue of Scientific American (a once reasonable bridge for the scientifically-literate-but-time-limited, now dumbed down to a cursory high school level) has a similar article (an opinion piece) titled Trust Me, I'm a Scientist. I just yesterday posted a whimsical contrasting view of my own: It's Magic. This is an interesting article. I am not inclined to believe that conservatives and liberals differ fundamentally (or at last not monolithically) in their ability to accept science. Conservatives were, for example, at one point very important in the US conservation movement, the EPA etc. What's clear is that climate science is currently caught in a larger political narrative at present that largely swamps the scientific narrative. That's one reason most scientists won't participate in this debate -- they don't have a clue what the script is and they're aware enough to realize it. It's like that nightmare when you find yourself on a stage acting in a play and you have no idea how to respond to the cue someone feeds you because suddenly the play has changed. It goes both ways, non-scientists exposed to the scientific narrative can't recognize the storyline and are immediately lost when confronted with the reams of literature out there. So they retreat into the narative they're comfortable with, which looks something like they see on ESPN...two teams banging it out. It does seem that the modern Republican Party (of the last couple decades) has shifted to an outright rejection of science as a mediating influence over policy. Personally, I think this shift is related to the adoption of PR mechanisms borrowed from marketing, which explicitly work on the native tendencies Chris Mooney is writing about. Such methods require messages that are simple to deliver and that target people's sense of identity. Nuance is not an advantage, so science becomes a hindrance really. Eventually, it's just been left out altogether so as to fashion efficient messages implying threat from some anonymous group or another. The circling of the wagons - the brand loyalty, if you will - that results is a real firewall against big losses politically. If those in the wagons have cash, all the better for the party in question - especially now that money is equated to speech in the US! It's a very rational to adopt such an approach from the point of view of politics. Of course, nature could care less what works in politics. I'd argue that undercutting science as the Republicans are doing is ultimately very bad for the very business interests they claim to support. Thanks for the attribution on the tactics, however, it should be noted though that Diethelm and McKee used our definition of denialism as well. Misrepresentation: Denialists tend to misrepresent - whether ignorantly, inadvertently, or intentionally - the scientific literature as well as the statements and positions of scientists, scientific bodies, and other advocates (individuals or groups) supporting the mainstream/consensus position. Such misrepresentations are made in the service of almost every other characteristic of denialism, which is why I would promote them to a separate characteristic. - related to my other suggested characteristic, below, the continuous use of misrepresentation creates an environment in which denialist claims can be accepted with undue credulity. Credulity: Denialists tend to accept - and propagate - with unseeming credulousness claims made against the body of mainstream climate science, or against scientists or advocates espousing mainstream climate science, or even against the physics underpinning mainstream climate science. Such credulity extends to accepting claims made on the basis of poor physics (e.g the typical crank claim that the atmospheric heat-trapping effect violates the laws of thermodynamics or other stuff routinely discussed @ Science of Doom), poor statistics (e.g. the material routinely debunked by Tamino), long-ago-refuted or dismissed material (e.g. claims that the heat-trapping effect of CO2 is saturated) or even self-contradicting sets of claims (as documented elsewhere here on Skeptical Science. As with misrepresentation, credulity is such a key component of other characteristics of denialism that IMO it deserves to be a characteristic of its own. Also, suffice to say, the credulity required to engage in denialism puts paid to the self-identification of denialists and contrarians as reasonable skeptics. - With regards to the additional characteristic suggested above, denialist credulity in climate science allows the unquestioned acceptance of various misrepresentations, however blatant. The important thing to remember with the "The 5 characteristics of scientific denialism" is that all five characteristics can be equally applied to people on both sides of the argument. Denialism (or 'repudiation' to use the correct English term) is absolutely essential to the advancement of knowledge. All the great discoveries were made by individuals repudiating the scientific consensus fashionable at the time. Justin - your comment falls under characteristic No.5, the logical fallacy. More specifically, you have put forth the argument of false equivalence. Can you provide one example where a mountain of congruent scientific evidence, like climate science today, has been overturned by an individual, or group, that doesn't even have a competing hypothesis? Denialism is set squarely against the advancement of scientific knowledge and against innovation. Who are antivaccine denialists, AIDS/HIV denialists, germ theory denialists? They're homeopaths, chiropractors, holistic healers, reiki masters, and the like. They're the parents of autistic children asserting vaccines caused their childrens' autism and then resorting to bleach baths & enemas or industrial chelation to try to 'treat' it. They're the people claiming cancer is caused by liver flukes (Hulda Clark) or "acidity" (Robert Young). What they are not is furthering our understanding of immunology, virology, bacteriology, microbiology, and biochemistry. Likewise, young-earth creationists (engaged in denialism of geology & evolutionary biology) aren't the ones furthering our understanding of genetic evolutionary mechanisms or geological processes or paleontology. Suffice it to say, the suggestion that denialism is at all associated with scientific advancement is IMO unequivocally false. as it is given for the phrase "first suggested by Mark and Chris Hoofnagle" at the end of the article's second paragraph. (6) Resorts to "magic bullet" arguments, erroneously believing an entire scientific theory can be unwoven with a single piece of evidence. (7) Resorts to a "I'm not saying X; I'm just a guy with some questions" position... (see Joe Rogan vs. Phil Plait) but does not actively seek answers for these questions or supply an alternate hypothesis which explains as much of the evidence as the existing theory does.